Are There Any Science Fiction and Fantasy Stories About Easter? I can think of dozens of science fiction and fantasy books written for adults that are about Halloween in some way. At least the first dozen wouldn’t require me to google anything at all, and I know I’d barely even be scratching the surface at that point. Given enough time, I could scrounge up shorter lists of Sci-fi/fantasy books about Christmas, Thanksgiving, Valentine’s Day, and other holidays, too. I haven’t read any fiction about any type of religious customs or beliefs in a very long time, so the vast majority of the books I’d come up with for the above categories would be purely secular takes on those holidays. For example, Santa and his reindeer would be heavily featured during Christmas, and Cupid would steal the show on Valentine’s Day. Some of the tales I recommended would offer dark takes on their subject matter in which Santa is a villain or monsters really do come out to prowl on Halloween night. Others would be pure silliness that was obviously written to make adults feel like kids again. There are hundreds of novels and short stories out there that include various religious ideas. Some of their ideas are based on real religious beliefs, while others are about religions that only exist in the author’s imagination for the purpose of serving the plot in some way. If we expanded the above lists to include books that satirized, explored, criticized, applauded, or even simply acknowledged the existence of various religious beliefs, my lists would only grow longer. The point I’m trying to make with all of this is that many holidays have been thoroughly explored for the purposes of telling a great story. So where are the science fiction and fantasy tales about the Easter Bunny that were written for an adult audience? I’ve been wracking my brain over this question this week, and so far I’m coming up with nothing. The handful of books about Easter as a secular holiday that I’ve thought of were written for preschoolers. There is nothing I can think of or find online that was written for anyone older than the age of six. 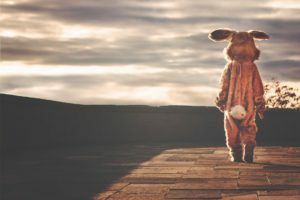 Is the Easter Bunny too silly a concept for the average adult scifi/fantasy fan? If I get responses to this post, I’ll either write a follow-up to it or edit this post with everyone’s suggestions. It bothers me that this holiday is being short-changed!